Workout programs can be confusing. How often do I train each lift? How intense should I go? What percent of my 1RM do I use? Should I do 5/3/1 or The Cube or The Shut-Up plan? How many exercises do I need for each body part? How does training change when your goals change? What does the latest exercise science say? Now you can have the answers to those questions at your fingertips. I am excited to announce that a project I have been absorbed in over the last several years has finally reached its culmination. 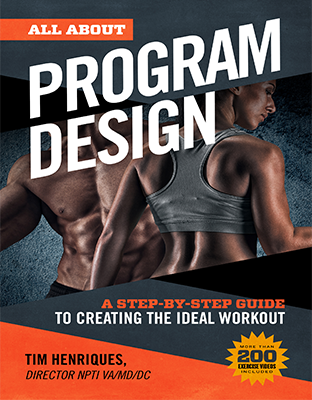 My latest book All About Program Design is now available! In my first book, All About Powerlifting, my goal was to explain everything that a budding powerlifter or a serious fitness enthusiast would need to know to be very successful in the sport. When any writer publishes for the world their first work naturally one is nervous about how it will go, but happily that book was very well received. My second book, NPTI’s Fundamentals of Fitness and Personal Training, is the textbook for all the NPTI Personal Training Schools across the country. My goal in that text was to explain how the body works and how the body responds to exercise. That book was also well received but let’s be honest, not that many people read academic textbooks for fun. With my third book, All About Program Design, I wanted to teach people how to write awesome workout routines that get serious results. I also wanted to make it as user-friendly and easy to follow as possible. Writing workout programs is a strength of mine and I wanted to share the how’s and the why’s of program creation with you. Most people told me All About Powerlifting was pretty amazing and they couldn’t believe the book was 486 pages long, but the one knock on it was that it didn’t include enough information on program design. Well, I hope I have addressed that issue – now there is an entire book dedicated just to that subject! All about Program Design provides everything you need to create amazing and fun workouts for yourself and your clients. Every major goal is covered – from beginners just starting out all the way up to those focusing on building elite levels of power. Of course, strength, size, and weight loss goals are covered in detail. One of my favorite parts about the book is a video library of more than 200 easy to access instructional videos showing you how to perform each exercise – just click on the link and there is the exercise, with real weight and real form. I wanted everyone to be able to use and immediately implement this information. The book is offered for the low price of only $9.00. You can order the book HERE on my website. Or if you prefer to use Kindle then you can order it HERE on Amazon. When you are ready to learn all the strategies and tips to create your own awesome routine, or you simply want to implement one of the many battle-tested programs already in the book, order your copy of All About Program Design now! Have been looking for something like this for a friend of mine. Thanks so much for posting!